Finding accessories that are eco-friendly as well as fashionable can be a challenge. 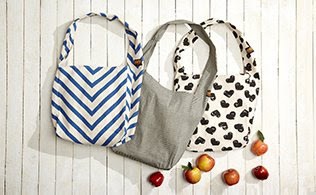 Enter Vine Street Market, creators of eco-conscious, chic totes. These lightweight and sturdy bags in relaxed and roomy shapes and cool patterns make toting goods and groceries a much more chic endeavor. About the brand: LA-based Lara McCaughrin and Christie Little launched Vine Street Market in 2010, creating stylish bags from re-purposed fabrics and organic materials using environmentally-conscious manufacturing methods. If you love Market Totes, did you know you can find them on Ebay? Requested on Sept 28/08 - will post again when received.